Cphonic Online Mastering Service is the pinnacle of acoustics design, featuring a 430 square foot audiophile studio environment with an absolutely flat monitor response due to the massive depth of our built-in bass trapping. 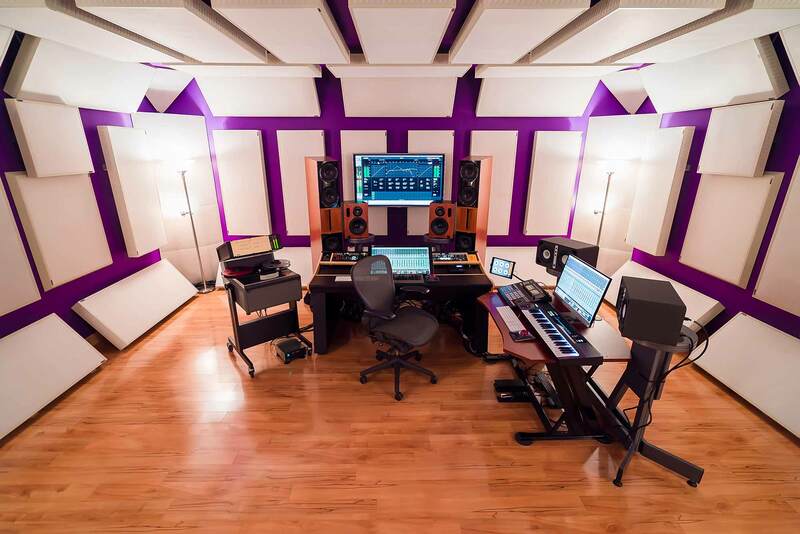 The Real Traps acoustic fixtures that line the walls provide further refinement of the sound, making this the most accurate control room music producer / mixing engineer / mastering engineer Kevin McNoldy has ever created. When your music can be heard in the most accurate room possible, it means that your audio can be enhanced to its fullest potential… again, giving you the competitive edge. The equipment is wired by hand with custom cables exclusively used by Cphonic, and no audio patchbays are used in the signal path for an absolutely pure connection. In the digital realm, Cphonic features the finest conversion available today, from the Cranesong Solaris DAC to multiple Dangerous Music Convert-8 multi-channel mastering DACs, to the Dangerous Music Convert-AD+ ADC, to the RME ADI-2 Pro reference ADC / DAC, to the extreme power of the Apogee Symphony I/O mkII. All converters are clocked by the incredible Antelope 10MX Atomic Clock or the Black Lion Audio MicroClock MkIII-XB, providing the most accurate master clocking and conversion we’ve ever measured. The difference is breathtaking! As with the analog signal, there are no patchbays added to the digital path in order to keep your audio absolutely pure. This means your music's overall tone and dynamics are not colored or altered in any way, unless it enhances your material by choice--our signal chain is absolutely transparent, so you only get the best out of your music, with nothing degrading the sound. Cphonic's no-expense-spared approach also extends to our custom-built ATR Services one inch Ampex ATR-102 analog tape machine, which has been upgraded to Cranesong / Dave Hill-designed Aria Reference Series electronics. This "super analog" machine does the heavy lifting in the mastering chain, providing the most open, rich analog tape experience you'll ever hear. In an increasingly digital world, this rare and incredible sounding one-inch tape format (the widest and most robust tape format ever created) is the absolute best for adding glue, width, dimension, and fatness to in-the-box computer mixes, and it also serves as the ideal high-end two-track archival medium. We call it the "retina display for sound." Hearing is believing… our "free song mastering" offer listed on the Home page includes running your mix through this audiophile masterpiece. The mastering studio monitors chosen for Cphonic are from KS Digital, a German audiophile speaker manufacturer who is the first in the world to integrate FIR technology into their products. This results in an absolute flat performance from the monitors, with no coloration or frequency bumps along the entire audio spectrum. Again, extensive testing was done over several years with every viable mastering-grade monitor on the market (take a look at Kevin's previous studio, Crystalphonic, to get a sampling of some of the many monitors he's owned over the years), and KS Digital won for absolute transparency and perfect translation of the sound. The results are stunning--every detail of your music's sonic picture is presented accurately, so the mastering process can enhance what's good and eliminate what doesn't work. A signal chain of this quality must have the ideal power system, and Equitech balanced power systems were chosen after testing different implementations. This results in the lowest noise floor and widest dynamic range possible in an audio system, with absolutely no extraneous noise added from the power. Each individual analog and digital component operates in its most ideal state, bringing a more precise, accurate performance to the sound. Again, nothing in our chain (including the power itself) alters your music in any way--so when we adjust your sound, it's by choice in order to bring out the best qualities of your material. In addition to the desk and ancillary mastering studio equipment being designed in a minimalist fashion and precisely angled to prevent reflections at the listening position, the desk and speakers are physically floated to completely decouple them from the floor and surrounding environment. This crucial step means the sound from the mastering studio monitors is completely unaltered and true to the source, with the excellent room acoustics presenting it in the most pure condition we've ever tested. All the "heavy lifting" outboard gear is wired in remotely to the computer, to keep the listening position as clean, uncluttered, and minimal as possible--a small working area equals cleaner acoustics (oversized console desks filled with electronics take a huge toll on the acoustics of a listening environment). This scientific approach to the design means your music can be heard with incredibly detailed clarity, making the decisions to bring out its best qualities the right ones. In addition to a wonderful stable of mixing and mastering equipment outboard choices (Weiss, TC Electronic, Dangerous Music, Sonic Farm, and more), DAW choices (Sonic Studio HD, Pro Tools, Logic, Studio One, and more), and a high-end plug-in selection of nearly everything available today (see the Equipment List), Cphonic houses a rotating set of Kevin's vintage collection of gear (pieces that impart wonderful color to masters, such as Neve, API, Telefunken, RCA, and more). The studio is also the home base for Kevin's music production, engineering, mixing, and songwriting work, so he maintains a full collection of microphone preamps and microphones (including vintage Neve modules and the incredible Chandler REDD Tube Mic). So, what makes the best online mastering service? We spent countless time and money getting the details listed above perfect, so your music can shine. This makes the difference you need to compete against the biggest artists in the world. And remember, with a room and audio system this accurate, Cphonic also represents the ideal hybrid mixing and production environment. So, if you would like your music project handled for more than just the final song mastering, please Contact Us!